Crisp Morning…. you wake up and hear the gentle whoosh of the lake and birds singing….. The silence is broken only by the sound of sailing boats crossing the water. This can be your every day at Portico Marina, in Zegrze, only 37 km away from Warsaw city center, Poland and only 25 meters from water. Portico Marina comprises state-of-the-art apartments directly overlooking the marina and the Zegrze Lake. It is the luxury of living in a unique place. A well thought-out architectural design provides not just a stunning effect, but also effective living. Portico Marina apartments offer a choice: be it an all-year residence, your second home or a buy-to-let investment. With its wide-ranging amenities, relaxed atmosphere and the proximity of the city, Portico Marina delivers on a promise of etery day holiday within your reach. The charming location of Portico Marina is just where the pleasure starts. Apartments by the Lake embrace an architectural vision to ensure your comfort and safety every day. The intriguing, organic form of the Portico Marina building attracts the eye, but the functionality goes well beyond the smart looks. 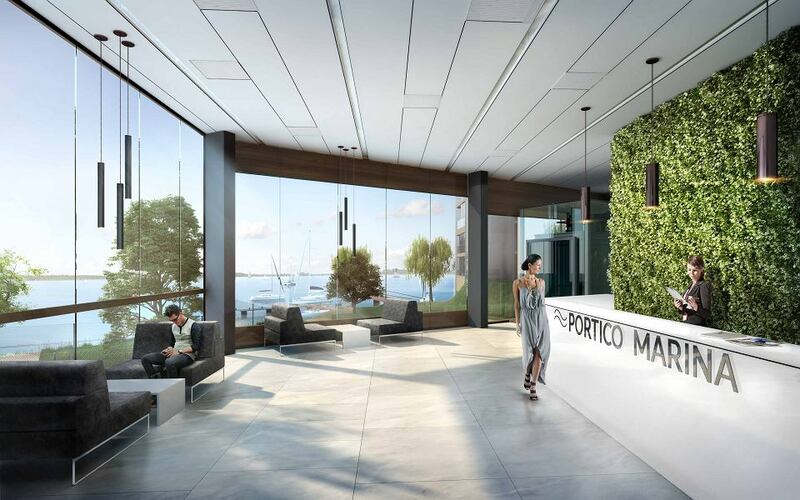 The well thought-out architecture matches the surrounding environment and the striking facade makes Portico Marina perfectly harmonise with the green landscape of Zegrze. Situated along the shoreline and equipped with appropriate architectural solutions, every apartment boasts a direct view of the lake. Beautiful nature and the charming lake just steps away will make every day extraordinary. The waterfront location by the Zegrze Lake ensures that Portico Marina residents can make the most of what the reservoir has to offer. The Portico Marina own waterside facility guarantees the comforts of a private marina and an opportunity to take part in more than a dozen regatta events a year. The ice and snow covering the lake surface during the winter season provide perfect conditions for enthusiasts of iceboating or snowkiting. Active leisure lovers will find extensive leisure and recreation facilities to choose from. In addition to many swimming areas, there is a number of boat, catamaran, kayak or windsurfing board rentals and a cable wakeboarding facility on the Zegrze Lake. Thus, a cruise on the lake or honing your skills in water sports with professionals have never been easier. Portico Marina will have cyclists satisfied, too, with 12 marked trails covering a distance of over 350 km within the area.